Started raining just after three, two nights ago, got more showers on and most of the yesterday and today. 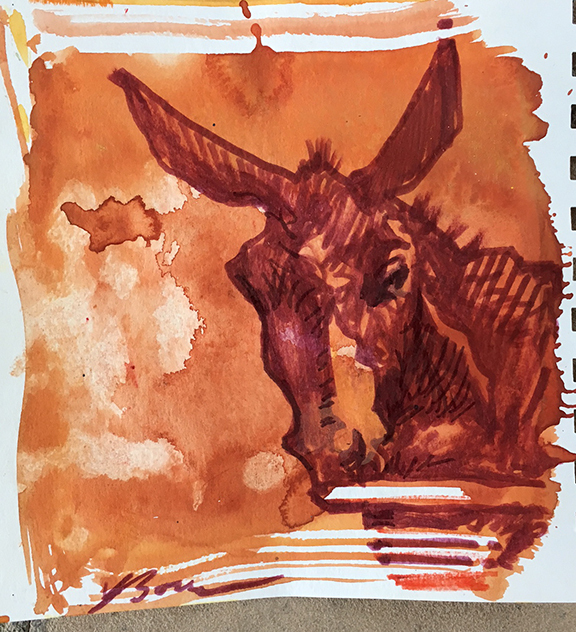 Worked in my studio on all kinds of mule subjects: charging mules, climbing mules, braying mules and crazy, bucking mules. 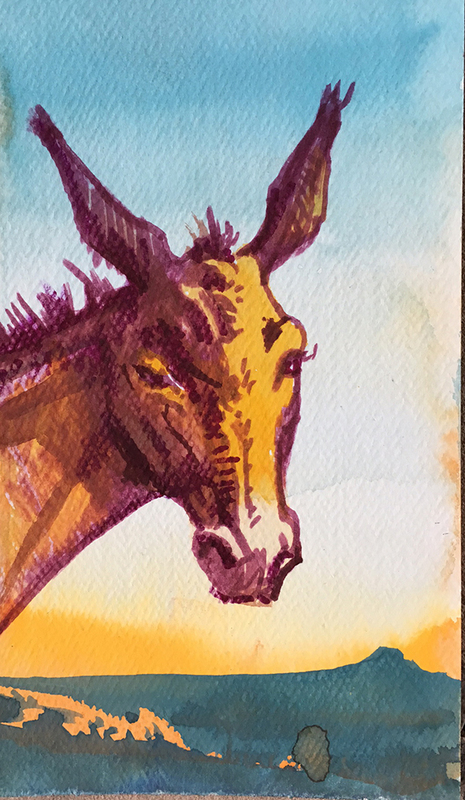 I'm also doing a series of mule portraits. Daily Whip Out: "Mule Portrait No. 1"
Daily Whip Out: "Mule Portrait No. 2"
Several years ago I went on a riding vacation in the Sierra Nevada mountains in Southern Spain. I had intended to ride a horse, but I broke my arm in a riding accident a month before we were due to leave on vacation. So, instead, for safety's sake, I was teamed up with a steady, 16-hands-high bay mule named Cordera. We rode 100 miles through the mountains along tiny goat paths that were only a few feet across and a long drop on one side. Here's the weird thing that Cordera did. We had to ride up onto a ridge at one point on the trail. It was a steep slope, with loose rocks, that seemed to go straight upwards, before it narrowed onto a trail that wound around the side of a cliff. The other horses on the trail took their time and found the climb hard going. We all ended up lined up on the edge of the slope. I couldn't ride forward because of the horse in front. My mule grew impatient to be moving and cranky at being wedged between two horses while standing on the slope. 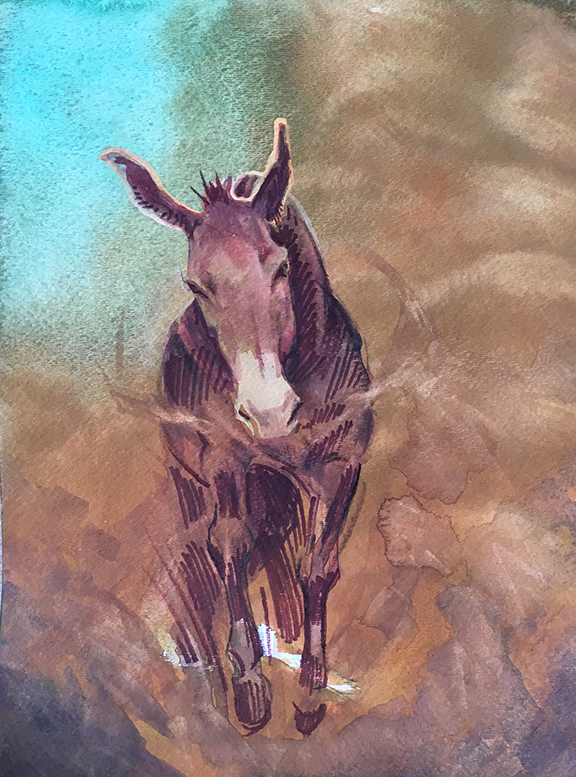 He began to flick his tail dramatically at the horse behind him, took a few bouncy hops backwards and forwards, launched his back legs into the air and walloped the horse behind him cleanly in the chest. He didn't so much as buck, but do a sort of jump-kick, which was impressive considering he was standing at an angle with his front end higher than his back when he began. My broken arm, which I had been resting on the saddle horn, flew up into the air and out and back to the side. There was a loud pop. I was in agony. I said a few choice words to Cordera, I can tell you! The days afterwards, I realized I could move my arm around better than before. When I went home, I had an x-ray done and the doctor told me that my arm had started to heal. Basically, to sum up, in doing what he did, the mule reset the bone in my arm. I was due to have surgery when I returned home, but I didn't need to thanks to him. It's been 20 years since this happened and the arm that was broken probably has better range of motion than the other does and it's all thanks to a cranky mule! Daily Whip Out: "Charging Mule"
"Until one has loved a mule, part of the soul remains unawakened"
"The mule is an enduring animal, he will bear fatigue and cold, and heat and hunger, and abuse. The greater the hardship, the more patient he becomes. But no man can trust a mule"